‘Often imitated, never bettered’ is a phrase that could easily be applied to The Best Four Days In Gaming. There are so many conventions these days as gaming enjoys a renaissance aided by geek culture going mainstream, but Gen Con remains the original and still the best. For the avoidance of doubt, I use the word ‘geek’ as a compliment, having been a card-carrying nerd since the early 80s. That’s why, every two years, my family and I make the trip across The Pond to Indianapolis to forge some new memories and meet up with friends we’ve made through a mutual love of gaming. The truth is it costs us a small fortune, but it’s a pilgrimage we feel is worth the expense (and the wait). 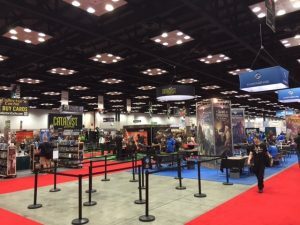 We know that Gen Con will be based in Indy until at least 2020 and, given its huge significance in terms of the local economy (an estimated $71 million), you can bet the powers-that-be will fight tooth and nail to keep the convention in their city well beyond that. It’s also worth saying that Indianapolis’s size and layout certainly aids the hosting of large-scale conventions. Pretty much everything is walkable Downtown – something we gamers certainly like. 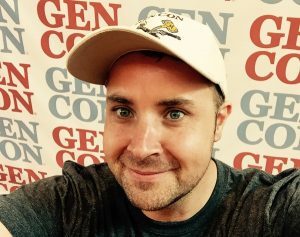 As it has grown – specifically since 2010 – Gen Con has taken over more and more of the Downtown area, with scores of games now being staged in a number of hotels, parties on the streets, and the Anime and True Dungeon events expanding this year into Lucas Oil Stadium (home of the Indianapolis Colts). It’s also worth saying that after more than a decade of practising, Indy’s hotels and retailers now ‘get’ gamers. They know what we like and, for the week of the convention, the city’s hotels, restaurants, and shops buy into it wholeheartedly with themed events and discounts. This is not something to be sniffed it. That’s not to say there aren’t tensions or problems. There are. Gen Con’s enviable growth in recent years means it has become a victim of its own success. Indeed, the biggest challenge for anyone planning a trip to Indy during Gen Con is trying to get a hotel room anywhere near the action. Finding a place to lay your head Downtown is akin to securing a ticket to play in the Cthulhu Masters Tournament (forgive the plug). In other words, your chances are slim by dint of the fact that there are so many attendees (60,819 unique attendees and a record turnstile attendance of 201,852 this year) and comparatively few hotel rooms within walking distance of the convention center. The reality is that the hotel booking system remains something of a lottery for us mere mortals – which isn’t particularly helpful when you are flying 4,000 miles in order to attend – with two young children in tow. And the hotels are not cheap, either. Unless you’re prepared to stay a few miles away from where the events are taking place – which can make getting to a game starting at 8am rather tricky. And it’s not just the hotels that are over-subscribed. If you are a member of the press granted the precious hour-long preview of the exhibit hall on the first morning, you now find yourself queuing with 300 Very Important Gamers (VIGs) plus their three companions (around 1,200 people). What does this all mean? Well, on one level, Gen Con’s organisers are playing a blinder. They’ve clearly cultivated an impressive brand and demand. By the same token, the sheer popularity of the original gamers’ convention means you have to be super smart and super-organised to get the best experience. But if you get it right, it’s, well… it’s awesome. With more than 16,500 ticketed events, the range and quality on offer is mind-boggling. This year there were more than 500 exhibitors in the trade hall for the first time. This is a huge draw for gamers wanting to snag a new release or bargain or just play in a few demonstration games. I’ll be honest, I could happily live in the trade hall – perhaps under a pile of t-shirts emblazoned with witty slogans or beneath one of those epic Dwarven Forge medieval castle dioramas. (Witness me trying to cram floorplans, miniatures, baseball cap, Gen Con hoodie, and a dice tower into my hand luggage for the flight home: Hilarious). I’m an avid RPGer and so Dungeons and Dragons (DnD) and Call of Cthulhu are my things. Touch wood, I’ve never had a problem getting a ticket for the events I wanted to play in, but I knew I’d struggle this year to land a ticket for the Cthulhu Masters Tournament – which is why I volunteered to help run it with five remarkably talented GMs who have become firm friends of mine. This was the only way to be sure I could be involved with CMT and I had an absolute blast. If you’ve never played Call of Cthulhu under tournament conditions at a convention, then I highly recommend it – particularly if the event is run under the umbrella of Novus Ordo Seclorum. 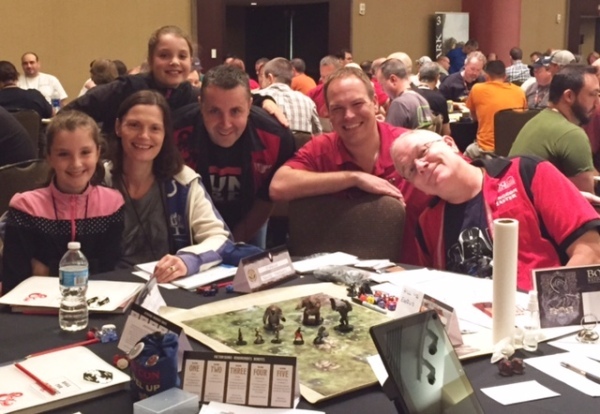 I also can’t praise enough the DnD Adventurers League offering, run by the team at Baldman Games, who provided the Dungeon Masters (DM) who ran the five games for me and my family over the four days. The Hillsfar ‘Special’ adventure was a particular treat – and thanks to our DM Dan Chapman for keeping it real and challenging us all. My wife and daughters also grabbed three of just six tickets available for an evening demo of a new Buffy The Vampire slayer boardgame (a co-operative game for 2-6 players by Jasco Games and Lynnvander Studios) which is set for release in October. 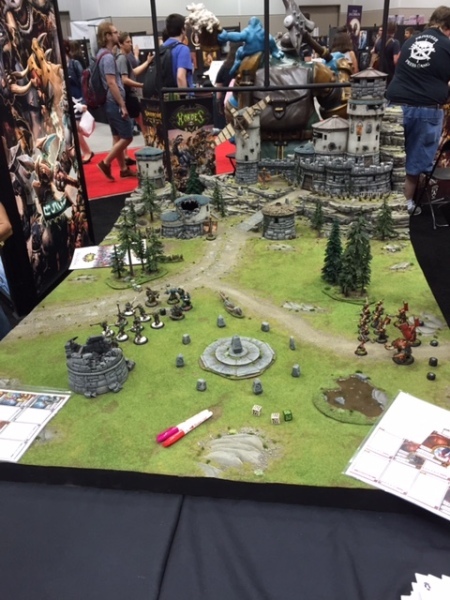 All in all Gen Con was the usual blur for the Tideswells. A case of game, buy, game, sleep, repeat (With the occasional eating thrown in at one of Indy’s many excellent restaurants such as Scotty’s Brewhouse). For the first time we got to watch the costume parade (which was awesome) and – thanks to careful planning – had ample time to browse the trade hall where we saw Dragonlance author Margaret Weis and artist Larry Elmore. In truth, there’s never enough time. Perhaps a week would be long enough for me. Probably not… Whatever I or anyone else say about the cost and the availability of event tickets or hotel rooms, Gen Con remains a spectacular, incomparable beast. It is the godfather and mother of all gaming conventions. Something that simply has to be done. Martin Tideswell is a 44-year-old journalist living in Stoke-on-Trent, England. He has been an RPGer for more than 30 years. He first attended Gen Con Indy in 2012, when he won the Cthulhu Masters Tournament (CMT), and returned in 2014 with his family when he was runner-up in the CMT. Martin won the DnD Red Steel tournament at Gen Con UK in 1997 and was a finalist in the DnD Open competition in the UK. 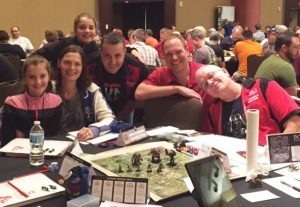 He is currently the Regional Co-ordinator (Europe) for the DnD Adventurers League and plays weekly with his gaming group at home.